All the water that we use comes from the North Saskatchewan River, but it’s not as easy as just sucking it up and distributing it out to everyone’s tap. Edmonton has a thorough water treatment system run by EPCOR making sure everyone has safe, clean, available water throughout the year. 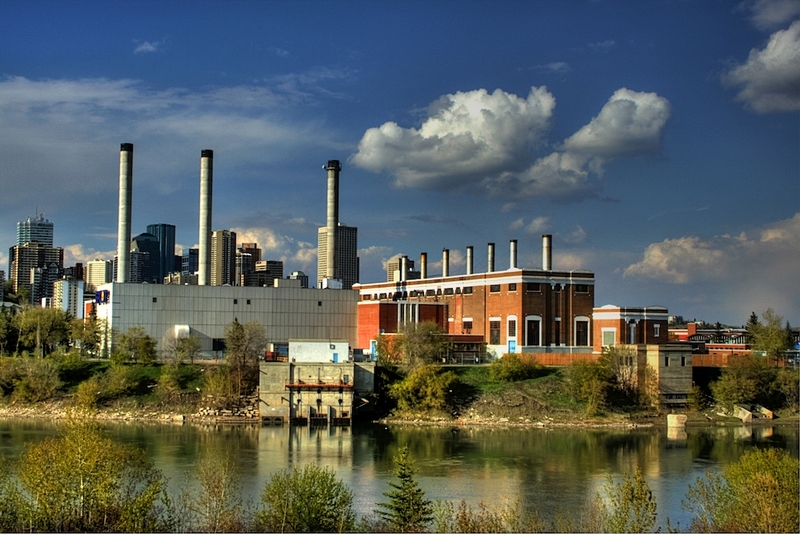 Edmonton has two water treatment plants. The E.L Smith plant near Terwillegar Park and the older Rossdale Plant downtown. Together these facilities are able to produce an average of 350 ML (megalitres) of treated water a day. The water is stored in 12 reservoirs with a capacity of around 800ML. As needed, it is distributed to Edmontonians and surrounding communities. The treatment process is broken down into 12 steps. Intake: The first step is the intake of water from the river. These intakes are near in the deepest parts of the river, near the lowlift pump stations, making sure the least amount of debris and other substances are taken in. Screens: The water is then filtered through screens to remove any debris from the intake. These screens have 1 cm2 holes that keep out sticks, leaves, fish and whatever else that is sucked up. Lowlift Pumps: Low pressure pumps are then used to pump 20 – 200 millions of litres per day (MLD). Chemical Injection: At first it may not sound the greatest, but chemicals are used to treat the water to help make it safe to drink. Alum and powdered activated carbon are the first chemicals added. Alum acts to remove solids in the water, and the carbon absorbs colour, taste, and odour causing compounds. Rapid Mix: Once the chemicals are added they need to be mixed well with the water. High intensity mixing is done at lowlift pump stations and mixing chambers. Flocculation: Polymer is added to the water to attract dirt particles. It forms large jelly-like particles called Floc. The Floc then sinks and gathers at to the bottom of the water. Sedimentation: Once all the Floc has settled at the bottom it is removed and the clear water is taken from the surface. Disinfection: Chlorine is added to the water to kill microbes and harmful bacteria. After the filtration process the water goes through UV disinfection which kills and disables other microorganisms. Ammonia is also added which combines with the chlorine to form Monochloramine, which acts as a long-lasting disinfectant. Filtration: A layer of anthracite coal and a layer of sand are used to filter the water by slowly flowing through it. On site Reservoirs: Now the clean water is stored in reservoirs so it can be distributed when needed. Dechlorination: Any water that ends up not being used during the process is dechlorinated by adding Sodium Bisulfite, ensuring that the water is safely returned to the North Sask. Highlift Pumps: High pressure pumps are used to pump 90-200 MLD from the reservoirs to your tap. Water quality is constantly being monitored during the treatment process. EPCOR tests over 300 different parameters (80 are required), with the goal of ensuring that the water coming out of our taps is consistently safe to drink. During the spring you might notice a taste difference in the water. This is due to all the snowmelt and increased runoff into the river. The treatment process has to accommodate for the increase of runoff and harmful bacteria that may be in the water at this time so some changes are made which causes some people to notice a more chlorinated taste in the water. The water is still considered safe to drink but if you are not a fan of the taste you can use a filter or refrigerate a pitcher with some added lemon or lime. I feel like I take for granted how water here is so easily accessible. Edmonton wouldn’t be here if it wasn’t for the river and the water it provides to sustain us. We’re blessed to live in a place where clean drinking water is literally right at our fingertips with the turn of a tap.